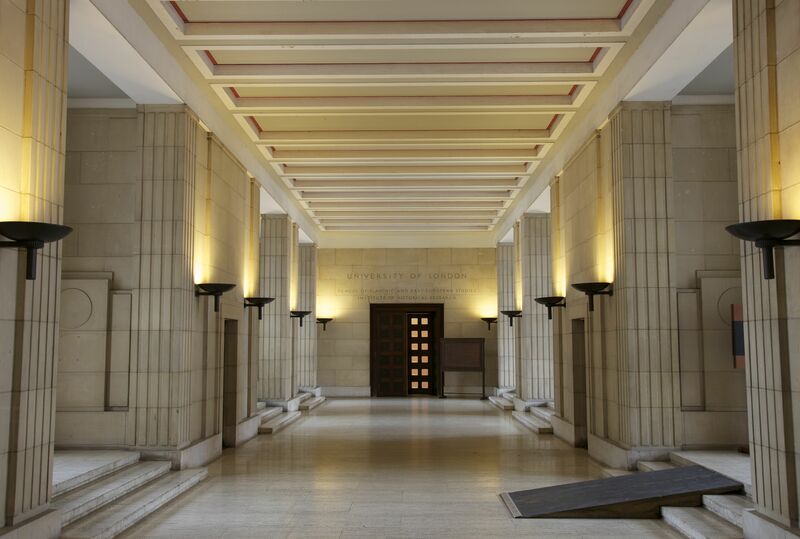 Senate House in London is one of the most distinctive Art Deco buildings of the 1930s. Designed by Charles Holden and situated in the heart of Bloomsbury between the British Museum and the School of Oriental and African Studies, Senate House is the administrative centre of the University of London. At 210 feet high, it was one of the first skyscrapers to be constructed in Britain, its imposing quality the result of both the building’s height and the bulk of the symmetrical wings that flank the central tower. Although the size of Senate House has since been eclipsed by many other buildings in central London, it remains a formidable presence in Bloomsbury, an implacable guardian of knowledge and the seat of its organisation. When I studied in London at the Architectural Association in Bedford Square – an independent school of architecture – Senate House seemed to me to be both a physical and symbolic barrier to the vast student world of the University of London to which I felt excluded from, and it was only years after I left London that I discovered the public thoroughfare that passes through the building’s austerely classical foyer. Buildings possessing a formidable character elicit contradictory responses: on the one hand, their size, symmetry and sense of power appeal to some as dignified and serene; on the other, the very same qualities can induce fear and loathing – the building perceived as totalitarian in its material and formal arrogance. 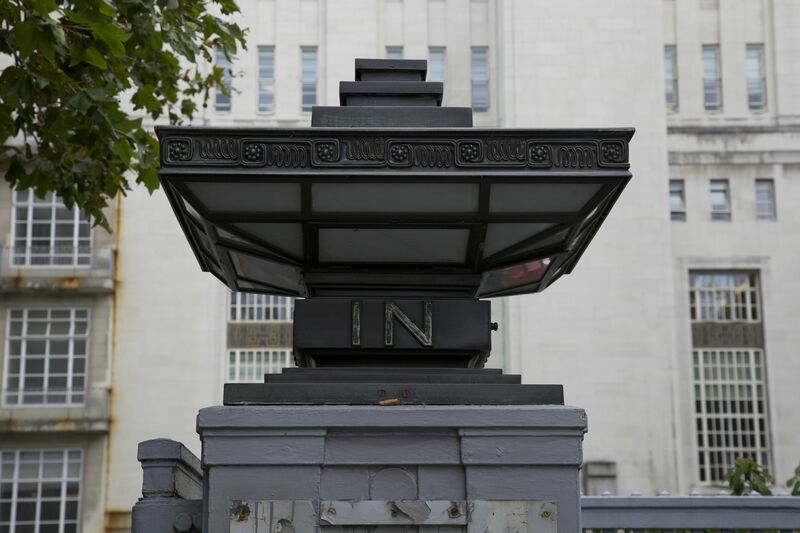 It is perhaps unsurprising, therefore, that Senate House took such a hold on the imagination of many both during and after its use as the UK government’s Ministry of Information in the Second World War. Temporarily relinquishing its role as the symbolic centre of enlightened knowledge, the building instead became the centre of war publicity and propaganda against the Nazis, a site of subterfuge, censorship, and creativity in the service of the war effort. Both Graham Greene and, more famously, George Orwell, would seize on Senate House’s wartime function and extrapolate the building’s imaginative possibilities: whether as the dark heart of an international spying network in Greene’s novel The Ministry of Fear (1943), or the even darker heart of a future totalitarian dystopia in Orwell’s Nineteenth-Eighty-Four (1949). Likewise, in Evelyn Waugh’s wartime novel Put Out More Flags (1942), the building’s ‘gross mass of machinery’ protected ‘all the secrets of the services’. In a different vein, in John Wyndham’s The Day of the Triffids (1951), Senate House operates as the last remaining vestige of governmental authority in a post-apocalyptic London, where most of the population have been blinded by a sublime but deadly atmospheric light show. These fictions point to the power of certain buildings as vehicles of the imagination – architecture that can be explored in the mind as much as in the flesh. 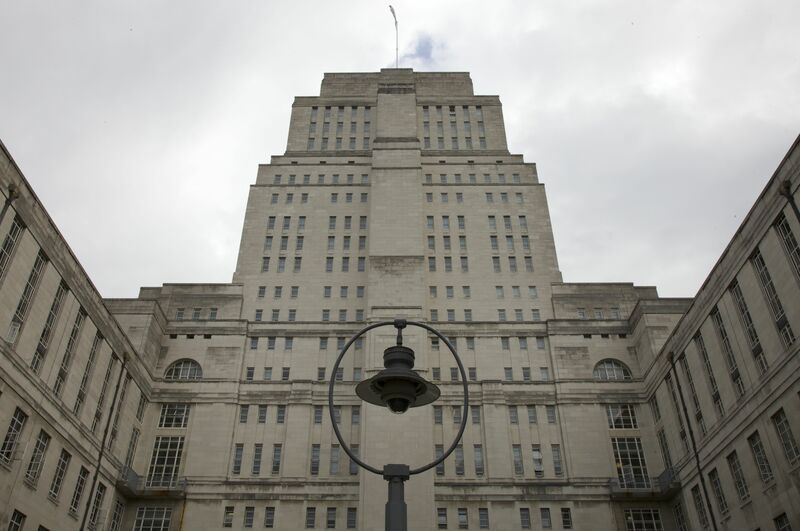 In Orwell’s case, Senate House clearly represented an extraordinarily concentrated image of totalitarian politics, perhaps on account of his wife working there during the war for the Censorship Department. 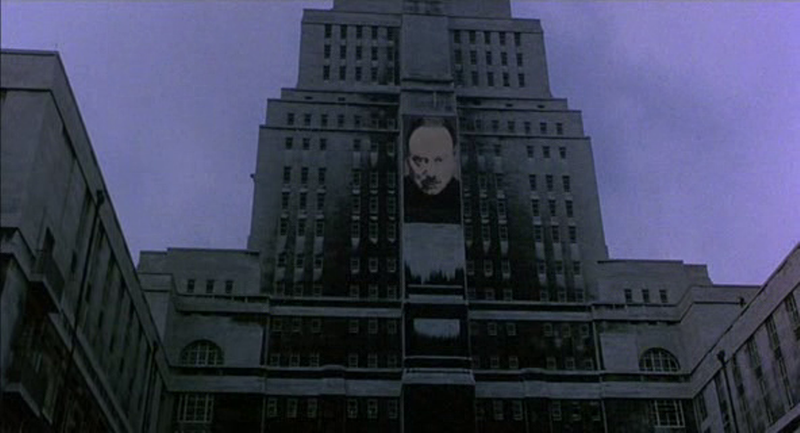 In Orwell’s terrifying dystopia, the dimensions of the building are magnified enormously: not only does Senate House – Orwell’s ironicially-named Ministry of Truth – grow to 300 feet high, it is also replicated in three other buildings of similar size and appearance (the ministries of Love, Peace and Plenty). In one sense, Orwell’s collection of outsized Senate Houses reflects Holden’s original plan for a much larger complex of buildings; in another, it completely inverts the supposed enlightened vision of its architect. Orwell clearly recognised that imposing buildings are haunted by an undercurrent of violence that seems to enhance their imaginative charge. He invites us to ask whether the survival of Senate House during the London Blitz was a result of its solid construction or of the Nazi’s desire to make the building their Party’s headquarters once Britain had been invaded and conquered. Out through the in door? 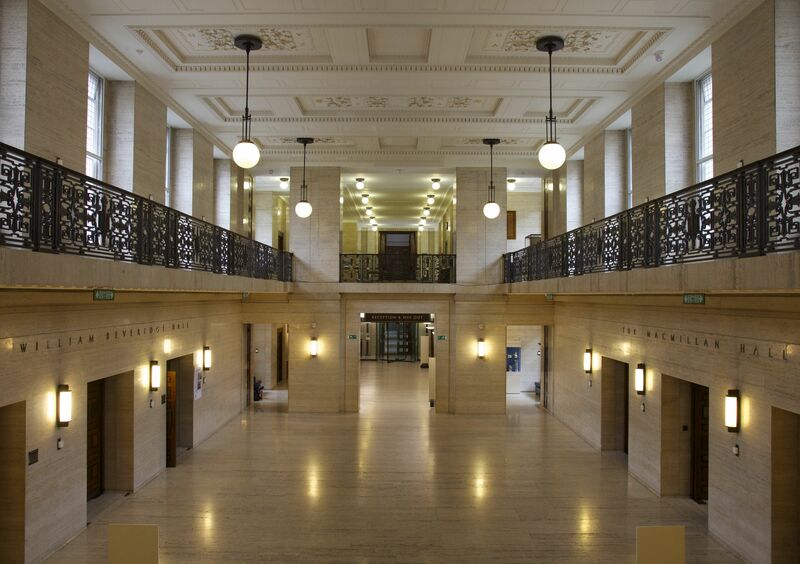 Of course, Senate House was only the Ministry of Information for a few short years; today, it’s used everyday by thousands of students and academics as a place of leaning, holding within it the central library of the University of London, occupying several floors in the central tower. 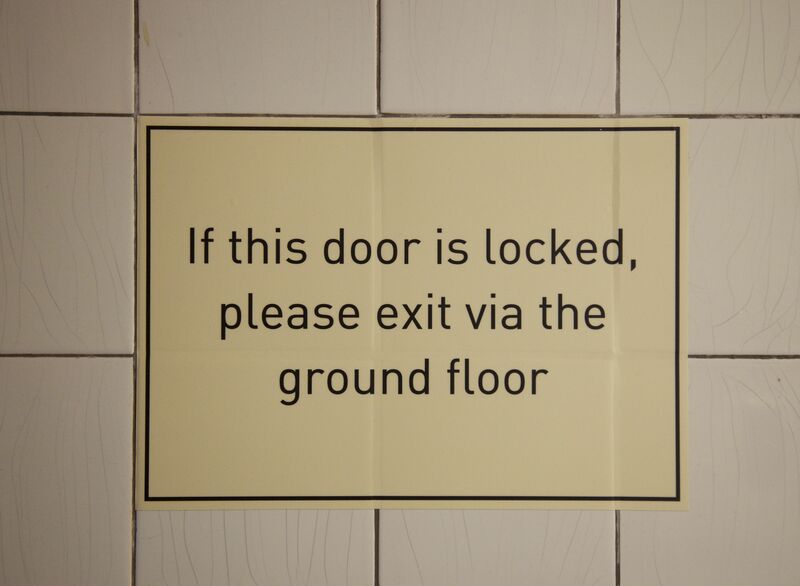 Yet, as a visitor to the building – as I always am – there is a pervasive air of authority that emanates from its spaces and textures: whether in the ‘In’ and ‘Out’ portals through which one passes in order to reach the building; the imposing anonymity of the marble covered atrium that admits visitors and passersby at the bottom of the tower; the polished immaculate floors of the grand interior lecture halls that magnify sounds and enhance their imposing sense of order; or the identical stairwells with their obtuse signage that disorientates. Immaculate symmetry and imposing order may reassure those coming into the building to study that their pursuit of knowledge is significant and sanctified; for others, it instills a sense of alienation and subordination. And I for one have only ever got lost in Senate House. 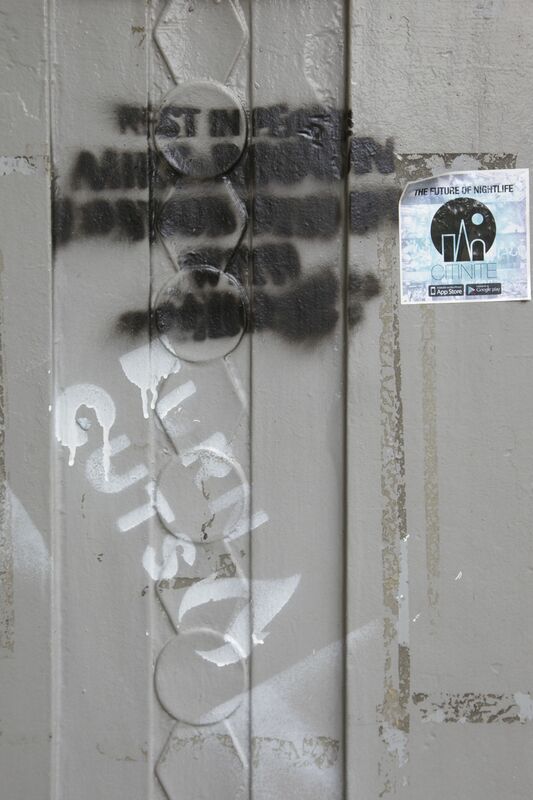 Outside the building, on the pillar that carries the ‘In’ command, are spray-painted stencils that offer different injunctions: from the rhetorical clarity of ‘Burn Cuts’ to the unreadable text that accompanies ‘Rest in Peace’, with an invitation to the ‘The Future of Nightlife’ adding to this haphazard linguistic meld. The command is, of course, central to the world of Orwell’s Nineteen-Eighty Four, whether the emblazoned signs proclaiming that ‘Big Brother is Watching You’ or the newspeak and doublethink pumped out in unending bellicose images and sounds. Yet, as these small tokens of resistance demonstrate, the rhetoric of power, whether embodied in a state or in buildings, is always being undermined by a counter-rhetoric that calls into question the vision of seamless order. It remains a moot point as to whether one kind of rhetoric requires the other; but there is no doubt that the imagination works powerfully, if darkly, in the spaces opened up in between. Superb piece Paul. Slightly chilling regarding the potential Nazi HQ. Fascinating interior shots. Thank-you! A rumour I think rather than established fact. Certainly they wanted the Midland Hotel in Manchester (and avoided bombing it for that reason). One of my favourite London buildings – thanks for the fascinating insights! I pop in and out of Senate House near enough every day, and absolutely love it. It’s very much the Borgesian labyrinth to me. Another chap (whom I didn’t know) and I were sitting silently reading in there one evening last week. We’d been sitting there for hours in silence, and must have been the last people on that otherwise very long floor, when the lights suddenly went out. Out of the darkness he said very simply: “We are too still.” I thought that just about summed it up. It’s almost a place removed from time. A kind of Gormenghast, maybe. A lovely story! There’s a book to be written about how we experience libraries.